Everyday Fray: From K - Dressing it Up! In less than two weeks I'll be jetting down to Salt Lake City for my first even sewing/blogging conference. Although my to-sew list is beyond overwhelming right now, I decided that making a few new garments are an absolute necessity. I don't generally need an excuse to make new clothes, but it seems absolutely fitting to wear handmade in a venue full of people who will not only notice but will also really care! Last week I picked up a Liberty of London Lifestyles print that I've swooned over for months (10% at my local quilt shop) and have decided to make it into another Staple Dress (see my first Staple here). Then just yesterday I scored some amazing chambray-esque purple fabric from Fabricland for $7.50/m! Beyond amazing deal right?! 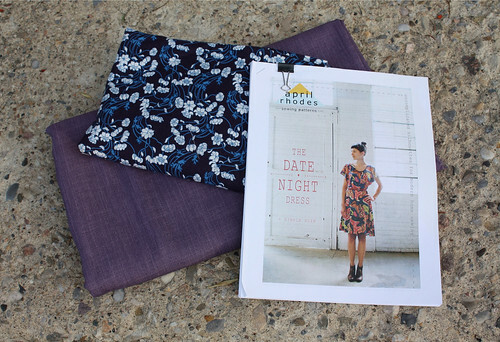 The drape of this fabric is so soft and beautiful, I can't wait to try out another of April Rhodes designs, the Date Night Dress. If these dresses turn out half as stunning as I anticipate, I may have to stock up on more fabric (that Fabricland score comes in about 15 different colours, all on sale - Canadian friends, hit up your local FL before I clear out all of the inventory!). I'm beyond obsessive right now with April's designs. I'm positive these will be the perfect last minute suitcase additions and I can't wait to wear them around. To keep myself on track, I'm linking up to the September: A Lovely Year of Finishes over at Fiber of All Sorts. Come join in on the fun, the goal setting link is open until midnight on September 7 so there is plenty of time to participate. Last year at sewing summit it was a lot of fun to see all of the handmades - the dresses will be great. I only managed a tote but if/when I go again I hope to be sporting some clothes too. Have fun.